The other important clarification from the documentation above is that the A/V Authentication service (being an internal communications service) does not require a certificate from a trusted third-party Certificate Authority. 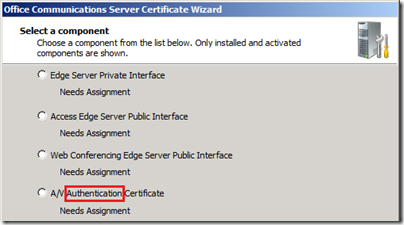 The same internal Enterprise CA that issues the Internal Edge certificate should be used for A/V Authentication, but not the same certificate; each role should have its own dedicated certificate. Of course if no internal CA is available then a trusted public Issuing CA can be used for any and all of the roles, it’s just more costly. I’ve seen all the arguments for wanting to use a single certificate for all the Edge Server roles and they almost always break down to a single issue: Cost. And companies on a tight budget certainly can and will balk at the first sight of the needing 4 certificates, especially if the deployment of an Exchange 2007 Server certificate with all 147 SAN entries is fresh in their minds. But when comparing costs of the certificates for a single, simple deployment of OCS it can actually be cheaper to purchase multiple certificates instead of one. First off, it has been established that 2 of the certificates should be issued by an internal private CA which is typically handled by an in-place Windows Server Enterprise Certificate Authority. Cost so far: $0. This leaves only the two remaining externally-facing, certificate-requiring services: Access Edge and Web Conferencing Edge. The typical argument is to attempt using the same certificate on both roles in order to ‘save money’. But a more costly SAN certificate would be required as the Common Name value in the Subject Name field would need to be set to the Access Edge FQDN (typically sip.domain.com) while the Web Conferencing Edge FQDN would need to be included in the Subject Alternative Field (SAN) (e.g. webconf.domain.com). Most of the major players in the field offer UCC or SAN certificates at roughly more than double the cost of their standard SSL certificates. For example, looking at Digicert’s current offerings one can see that the cost of a single UCC cert for 1 year is $328 but the cost of two separate standard SSL certificates would be $144 each, at a combined cost of $288. Thus, it is pretty hard to argue against best practice recommendations when it also ends up being more expensive. But if an organization is required to support more than one SIP domain with Automatic Sign-In for external user access or for anonymous external Live Meeting access then the above cost savings comparisons are not as relevant. Following is a brief review of why these two requirements might impact certificate costs. If a user with a sign-in name in the additional SIP domain (jeff@fabrikam.com) needs to login externally via Edge using Automatic Configuration with Office Communicator then there will need to be a publicly-resolvable SRV record (_sip._tls.fabrikam.com) in the same domain as the OCS user’s sign-in domain. That SRV record must point to an A record in the same domain (sip.fabrikam.com), it cannot point to an A record in another domain (like sip.contoso.com) as then the Automatic Configuration process would fail. Because the OC client is given (via DNS) the hostname of sip.fabrikam.com to connect to for Access Edge services, the assigned certificate on that Edge server must include that hostname. 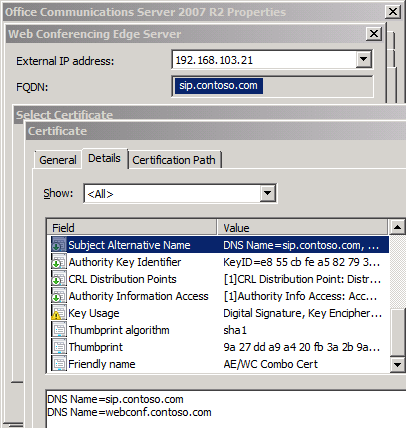 If it is currently only configured with a Common Name of sip.contoso.com then the OC client will fail to connect with a certificate name mismatch error. Additionally if that same user sends a Live Meeting initiation to a foreign party with the intention of having them join the meeting anonymously over the Internet, the sending user’s SIP domain (fabrikam.com) is what the anonymous user’s Live Meeting client will perform an SRV record lookup against. This puts the anonymous Live Meeting client into the same scenario as the Office Communicator client using Automatic Configuration. This means that the Access Edge certificate needs to have entries for both SIP domains (sip.contoso.com and sip.fabrikam.com) moving it up into the more expensive SAN-certificate category. But for the same reasons as shown in the process above the Web Conferencing Certificate does NOT require modification. 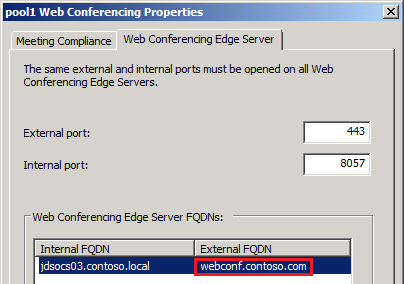 Only the Access Edge FQDN needs to be resolved in some way by clients and once a connection is made from the client, all other service FQDN values (Web Conferencing, A/V Conferencing, External Web Farm, etc) are passed in-band to the OC or LM client. Regardless of what SIP domain a user signs in with (@fabrikam.com) the other services are all still configured with a single FQDN value using the original primary SIP domain (webconf.contoso.com, av.contoso.com). Replace the Access Edge certificate to a SAN certificate (and leave the standard certificate on the Web Conferencing Edge) at a total cost of $472/year. This solution retains the more secure, best practice approach that will be easier to troubleshoot and manage over time. 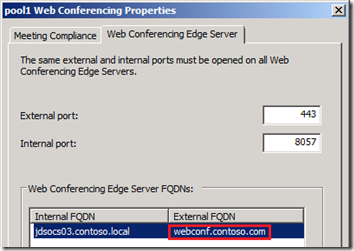 Replace both the Access Edge and Web Conferencing Edge certificates with a single SAN certificate for $288/year and insert the Web Conferencing Edge FQDN into the SAN field in addition to all supported SIP domains. 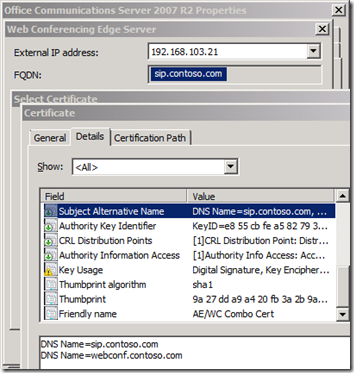 But ultimately, if neither of the automatic sign-in or anonymous access features are required (thus Manual Configuration will be used for all external Office Communicator and Live Meeting client connections) then the original SAN-less certificates can be retained as all external services will be resolved and connected to using the current A records in the primary contoso.com domain, regardless of how many additional SIP domains were added.